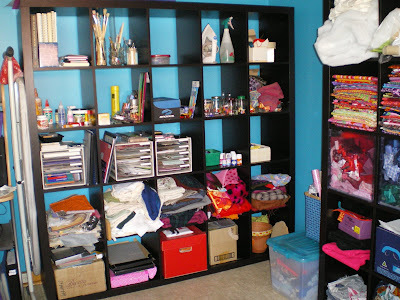 sunnysidey: Craft room - ta daaa! Okay, I'm cheating just a little bit here, because what these photos don't show is the vast pile of papers, sheet music, files and books that are scattered on top of the computer desk and sewing table. So I'm not ready to start sewing in here just yet. 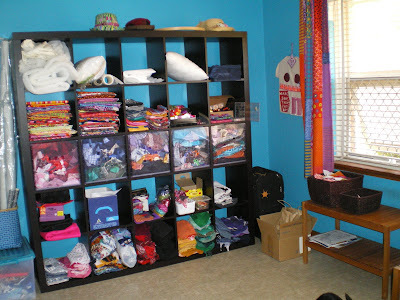 But I feel it's a big achievement to have moved all Cathy's fabric scraps out of their bags and into the storage unit. Ta daaa indeed, congrats, I know whata big job it can be! It's so hard to pack up as you go when the mood strikes!